Another Archipelego map for u guys. Official Tournament Map by Quanto. Revised by sprang. I hope you seriously cut down on the metal from features too, otherwise this is still just a puppy map. Yep, it's still just a puppy map. I'm not a huge fan of puppies ruining otherwise unique and interesting reclaim heavy maps. Puppies do need a fix for these kinds of maps, but truth be told, these maps are con spam even without puppies. Some reclaim is fine, but this map is way too extreme, it is the puppiest of all maps. Allright, if you tell me how much reclaim is good, I'll (re)make it so. Or you can tweak the map yourself too and upload a new version. Lowland_Crossing_TNM01-V4 has even more reclaim. Maybe you are thinking about that map it's a lot like this map. Lowland_Crossing is pure puppy spam. They're both pretty bad, this one is worse for some reason. I've never lost with puppy spam here, but it's beatable on lowland, probably because of the chokes. Klon suggested that Puppies could only work on wrecks. I think this'd be a good elegant fix for them. To clarify; what about debri? I suppose puppies could work on debris as well. The main point is that they wouldn't work on map features. vehs can climb the hills in north but not in south. Looks like a whole new map with the map extender. Agree, expand it, the expanded/mirror map look like it would be a nice map to play. with quad geo islands? :o Also you realize that's just a map border right? It would take way more work to actually remake the map that way. It would take way more work to actually remake the map that way. Actually not. A villain named Burp has made a map multiplier program, and tested his evil device by creating stuff like very long icy run. Does it work for more then long linear maps? It can multiply in all directions from what i've seen. 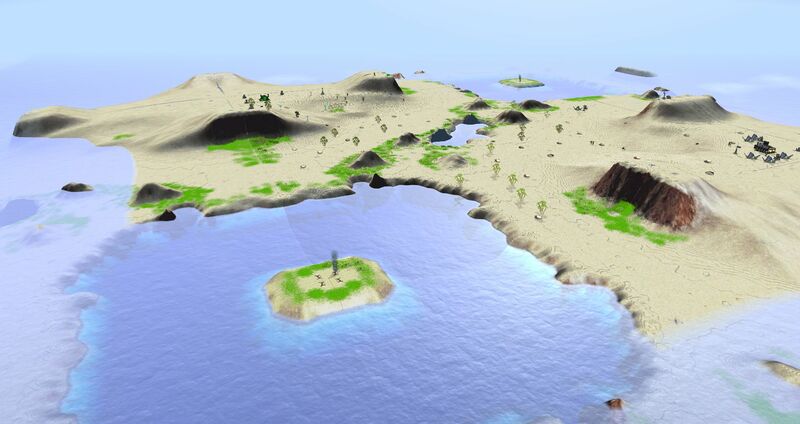 Looking at CarRepairer's screenshot, though, it would also need to deform terrain by fading heightfield into ocean, hum. So probably not that easy after all. That's not difficult. Open in gimp, select border of height map, make gradient. The very act of editing a height map in GIMP creates even more work due to 8-bit limitation and the necessity of repeating the exact same operation with other essential map files, texture being the most difficult and memory-intensive. This is part of why I am trying to phase GIMP out of my workflow for the most part. Scripted operations like what World Machine is capable of are much easier to repeat across all images. Pretty sure this map is already 8-bit, look how the elevation is stepped.